Among all beer kind, the brews from French-speaking Belgium labelled “saison” can lay claim to being among the most idiosyncratic species I’ve sampled. Perhaps even more so than lambics, where a distinct family resemblance is at least clear, the beers described as saisons by Walloon brewers have often seemed to have little in common but their name. Sometimes weird, usually wonderful, and often among the most spectacularly lively beers I’ve ever encountered (some of the saisons I’ve tried down the years would put Champagne to shame during a Formula One podium celebration), the saisons of Dupont, a Vapeur (Saison de Pipaix), Blaugies (Saison D’Epeautre), Fantome and others (as well as the other, clearly related beers not under that label from Walloon country brewers) were unsurprisingly, given their explosiveness, well attenuated and often very dry. But they were also deeply earthy, hazy and usually with the unmistakable musty, farmyard aroma and flavour of Brettanomyces yeast activity in the background, whether intentionally added or otherwise. In some cases additional spicing was evident, although this was more common in the extended family of Belgian “farmhouse ales” from saison brewers than in the self-proclaimed saisons themselves. Saisons were also among the last major families of beers I managed to gain a broad sampling of. In the late 1980s and early 1990s, appreciation of Belgian beers was only just gaining traction in the UK and most saison brewers were too small to think about exporting anywhere, even just over the sea to Britain. They also had the misfortune to hail from the less fashionable (in beer terms) French-speaking half of Belgium, a fact that may have worked against them in terms of gaining attention at a time when there was an awful lot of unfocused noise around Belgian beers. Hence, long after I’d sampled the wonders of an array of real lambics, red and brown sour ales, Trappist brews, strong golden ales with devilish names, and even appalling “specials” such as the bright green, self-explanatory Minty and the (astonishingly even worse) bilberry-flavoured lager, Bosbier (I was never one to think everything Belgian was naturally superior to beers from other countries), my experience of saisons was limited to a one off encounter with du Bocq’s pleasant but unspectacular Saison Régal. Beer writer Michael Jackson’s enticing descriptions of other members of the style seemed contrary to this experience and an air of mystique grew up for me around saisons. This was eventually “quenched” as increasing efforts by CAMRA beer festivals and a handful of forward thinking beer shops and my own beer collecting and drinking trips to Belgium allowed my saison horizons to broaden. My fascination with saisons survives to this day and they’re still harder to get hold of than many other beers. Or at least the crankier Belgian varieties are. The saison “style” has seen explosive growth outside of Belgium, especially among American brewers, which seem intent on appropriating the saison tag in the same way as they have with IPA. The idea of distinct beer “styles” can be a useful one, if taken as a fairly high-level indication of brewing approach and broad flavour profile for a specific brew. That way beer drinkers can have an idea what to expect when they order a beer previously unknown to them. Humans by nature categorise the things around them so having words for categories of beer is entirely normal. But the idea of distinct beer styles can also impose undue restrictions on brewers if imposed overly judiciously. It can, for instance, serve to de-legitimise, in the mind of consumers, the claim of beers that have used a particular terms for years to actually be what their labels profess they are. This seems to be what has happened with saisons where the modern obsession with rigorously categorising beers has resulted in new-wave saisons becoming defined by their similarity with the (admittedly classic) Saison Dupont, making it the unelected archetype of the saison “style”. While this approach can produce formidable beers, such as those from Orange County, California’s The Bruery (more on them in another post), under such strictures a beer such as Saison de Silly – one of the longest brewed members of the tribe – would not obviously qualify as a saison. Efforts to attach any definitive set of characteristics to beers described as saisons – even the fairly loose ones provided by the American Brewers Association – seem therefore to be not only entirely arbitrary but also counterproductive. Instead, as with categories such as “winter ale”, it is the sheer variety of approaches, flavours and sensations that presents under the name saison that has made it such a fascinating label throughout my beer drinking career. Anyway, rant over. What has my recent return trip into the world of the modern Belgian saison (care largely of Beers of Europe’s excellent selection) revealed? I’m pleased to say that as a family (rather than a style) they remain an individualistic bunch, albeit with a bit more of a sense of conformism than I remember previously. Certainly, their once expressively individualistic yeasts seem to have been reined in somewhat, or at least their effects have been. Quite a few veer towards dryness and deep earthy hops as expected although, as this tasting demonstrates, even this generalisation can prove false. The bottle of Saison Dupont sampled here was not at all as many earlier tastings of the beer suggested, for instance. Here are my impressions, as usual in order of strength. 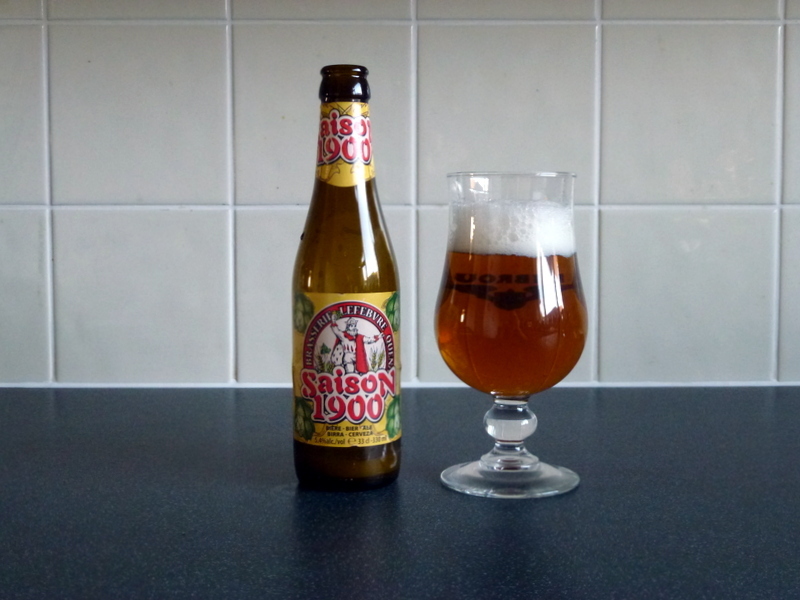 1) Saison Voisin (5%), Brasserie des Géants – An old saison brand produced until 1989 by the Brasserie du Voisin in Flobecq then resurrected in 2001, with the help of previous brewer Léon Voisin and (apparently) to the original 1884 recipe, by 1996 newcomer the Giants Brewery. The beer pours orange-red/amber with fine lacework and offers an aromatic and lasting hoppiness, bordering on earthy, clean and without noticeable acidity. Hard to know how much this resembles the original as unfortunately I never tried it. The brewery is in Ath in the western Walloon province of Hainaut. 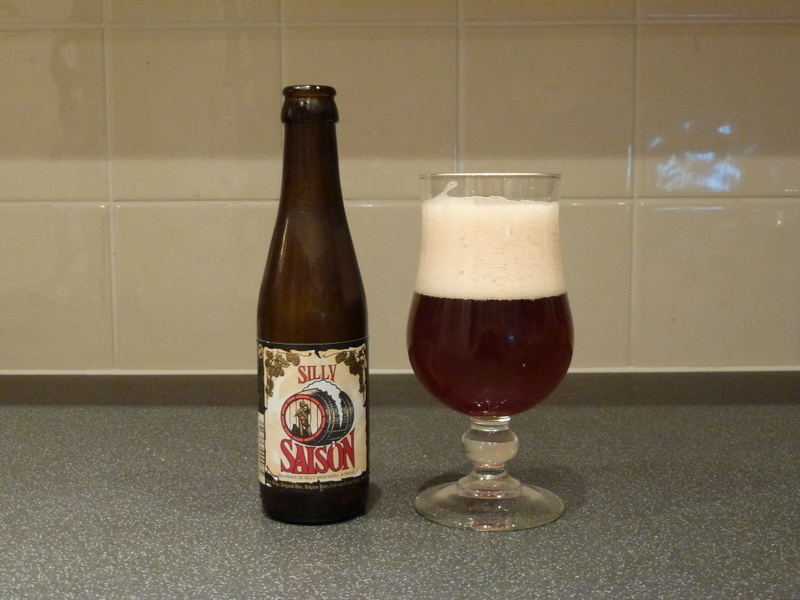 2) Saison Silly (5%), Brasserie de Silly – Apparently made by blending a pale brew with a darker one that has been aged for about a year in a metal tank. This approach, which is said to be closer to the original saison style, produces a deep red beer with a slightly musty aroma of pruney dried fruits. This gives way to a bready, sweetly malty brew with a slight counterbalancing acidity and hoppiness but overall lacking pizzazz, perhaps because of a lack of refermentation in the bottle. Brasserie de Silly is another farm brewery that gave up farming and has been brewing in the village of the same name in the Belgian province of Hainaut since 1850. 3) Saison 1900 (5.4%), Brasserie Lefebvre – One of the longer standing saisons in regular production having been produced continuously by the Wallonian Brabant brewery in 1982. Saison 1900 provides a well made if not stand out example of the style. A considerable head tops a hazy, golden beer with some prickly hop, an attractive yeastiness and some grassy and spicy notes. Brasserie Lefebvre, which is perhaps better known for its Floreffe abbey-style beers, is in Quenast, Hainaut in Walloon Brabant. 4) Saison Régal (5.5%), Brasserie du Bocq – Orangey-red, lightly sedimented and typically spritzy du Bocq brew with a good balance, peppery hops (brewery website says 30 EBU) and slightly peachy acidity. Light and quenching despite its colour. Not much like many of today’s Dupont-inspired saisons but one of the oldest in continuous production and fully consistent with my own tasting notes from 20 years ago! The sizable Du Bocq brewery owes its origins to an old farm brewery in Marbaix-la-Tour dating back to 1858 but is nowadays based near Purnode, near Yvoir in Namur, southern Wallonia. 5) Urthel Saisonnière (6.4%), De Leyerth Brouwerijen – Not actually described as a saison – it’s from the Flemish-speaking part of Belgium for one thing – Urthel’s Saisonnière clearly nods in the general direction of Wallonia. The beer pours hazy gold with a good head and offers a crisp (20% wheat is used in the mash), slightly yeasty brew with some peppery spice, good hop development and a lingering aftertaste. 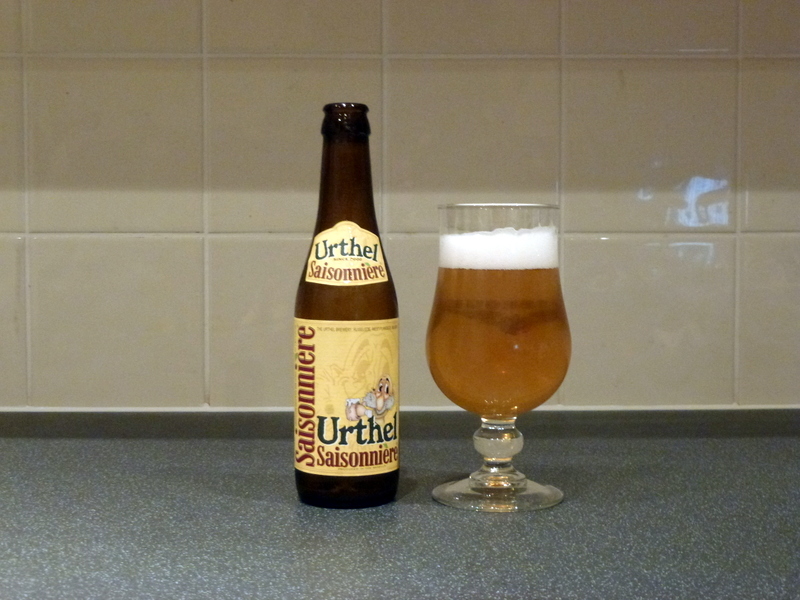 Urthel Saisonnière has been brewed since November 2009 in the village of Ruiselede in West Flanders. 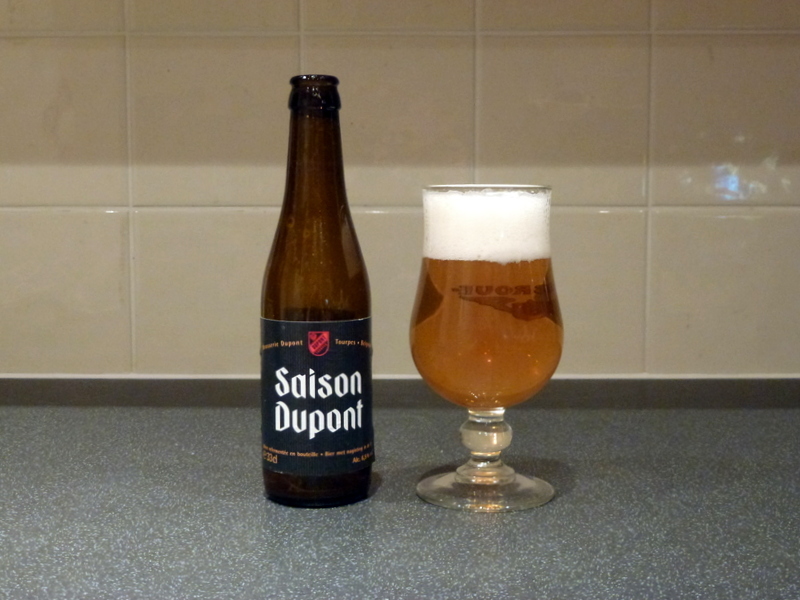 6) Saison Dupont (6.5%), Brasserie Dupont – Often considered the benchmark saison, this pale copper-coloured beer that pours slightly hazy and with a massive rocky head. A slightly unusual hay-like note on the otherwise hoppy and malty aroma (based on previous tastings), the beer manages to be full-bodied for its colour and reasonably dry on the aftertaste with a good lasting bitterness, if not as profound as I remember. Becomes more astringent and even slightly citrusy as it warms in the glass with a distinct if underplayed Brettanomyces character apparent. More than almost any other beer I can think of, chilling utterly destroys its unique flavours. The beer’s history goes back to 1844, the brewery’s to 1759. Brasserie Dupont can be found in Tourpes, West Hainaut. 7) St-Feuillien Saison (6.5%), Brasserie St-Feuillien – A new member of the Belgian saison clan (if not of the global saison family, which appears currently to be in a state of hyper growth), St-Feuillien’s example owes more to those of other diversified breweries such as Saison 1900 than it does to the more rustic examples such as Dupont’s. Indeed, Lefebvre’s is a reasonable point of comparison flavour wise. It is nonetheless notable for having its hoppiness cranked up noticeably compared with these peers, perhaps due to the needs of the American import market it has served since launch in March 2009. The St-Feuillien brewery, which is in Le Rouelx, Hainaut, has been run by the Friart family since 1873.